The Cougars carve a path to the big dance! The first weekend in March traditionally ushers in Southeastern PA’s District 1 Regional wrestling tournament. This past weekend was no different. Over 60 high schools from the four counties sent their district’s best to compete at the regional for a berth at the following weekend’s PIAA State Tournament, the penultimate event. From East, the remaining four of Keanu Manuel, Lukas Richie, Spencer Uggla, and Zach Sharaf put their training to the test. In the end, East finished in 9th place out of the entire 60 team field, qualifying two wrestlers for the state tournament. Senior co-captain Lukas Richie finished out his District 1 career with the 132 lb. championship and a gold medal. At 106 lbs, Keanu Manuel took 4th place and also booked his spot at states. The magical run of junior Spencer Uggla at 160 lbs. resulted in a 6th place finish, one place shy of a birth. And Zach Sharaf at heavyweight, with just two years of wrestling under his belt, went 0-2 at the tournament, but proved his potential is there. The final week of competition is upon us, and DE Wrestling and community would like to congratulate our regional competitors on a great performance, and wish our state qualifiers the best of luck up on the mats at Hershey! See you in Chocolatetown! East mines some gold at the inaugural District 1 West Tournament! This last weekend in February found the 15 wrestling teams in District 1 West convene at West Chester Rustin HS to see which competitors would advance to the regional. The top four placewinners in each weight punch tickets to the Southeastern Pennsylvania state qualifier next weekend. Downingtown East finished in 5th place, with 149.5 team points earned. The team put on a strong performance, finishing with 7 wrestlers in the final round, 3 champions, and a fourth place. Keanu Manuel (106), Lukas Richie (132), and Spencer Uggla (160) all won their respective weights and took home gold medals. Zach Sharaf (285) ground his way through the wrestle-backs and took 4th. Falling short of advancement, but competing in the final round were Billy Dyer (170, 5th), Ray Wilceczek (195, 6th), and Zach Aceto (220, 6th). East wrestling would also like to congratulate seniors Jett Lucas Murphy (138) and Will Vincent (145) on great careers in the blue and gold! The final four Cougars will now compete at next weekend’s SEPA Championships at Souderton HS to hopefully find a spot in the top five and punch a coveted ticket to the PIAA dance at Hershey! Good luck to all!!! The JV Cougars finish in stride! This past Presidents’ Day, Downingtown East hosted the annual Chester County Junior Varsity Championships in Boyer Gymnasium. This event features future varsity wrestlers from the Chesmont league and beyond, totalling 15 teams. The day recognizes those wrestlers who have put in the time on their respective teams and are on the precipice of becoming Varsity contributors. For the JV Cougars, Billy Dyer (170) was the lone champion. Jackson Swearhart (195) fought back to claim 3rd place, and Alex Hillestad (106) earned a 4th place finish. Other Cougars in the mix were Alex Viscomi (126, 1-2), “Vegas” Vic Cozzone (132, 1-2), Alejandro Santiago (138, 1-2), Jeff Scott (145, 0-2), Jack Myers (145, 0-2), and Johnny “Pants” Palladino (152, 1-2). Above all, these championships give the wrestlers a final shot at demonstrating what they’ve learned and allow them to see where they must develop. Congrats and good luck to all of the JV Cougars as they set new goals ad help the Varsity prepare for their post-season! The Cougars struggle in final dual meet! On Wednesday 2/13, East wrestling traveled out to Bucks County to take on the Neshaminy Redskins in a final non-league dual meet of the season. The Cougars knew the ‘Skins would be tough and well prepared as one of the more successful teams in District 1, but the line was drawn and the challenge had to be met. Neshaminy had too much fire-power and the battered Cougars gave all they had in a 49-24 loss. Keanu Manuel (106) and Lukas Richie (132) picked up falls for East, while Zach Sharaf (285) collected a forfeit. Jett Lucas-Murphy (138) and Spencer Uggla (170) both won hard-earned decisions for East’s remaining wins. As the dual meet season concluded, the Cougars finished 10-12, falling short of the .500 mark. There were many misfortunes with the team this season, among them, significant injuries and the lack of experienced members, but there was always a willingness to learn and fight. Hopefully, these values will continue on in the post-season and the years to come as East looks to rebuild. Good luck to all of the wrestlers as the Chester County JV Championships and the inaugural District 1 West tournament loom! July 6th – 10th. Save the dates and click the logo below to download the form! 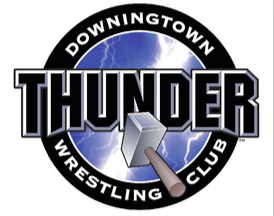 Thunder registration is now open!